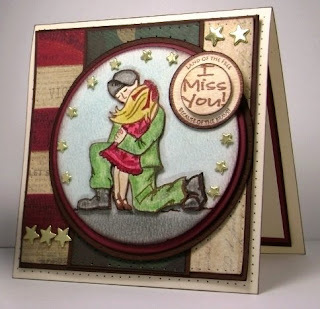 Here are 2 very special cards created with a new Military stamp set from 2RedBananas. http://2redbananas.com/main.sc. This awesome set is called "Come Home Soon" and it was designed and illustrated by my brilliant friend Jami Bova. Jami is super talented and as sweet as can be. She sent me a wonderful RAK that included this awesome set along with some wonderful ribbons from Korea. 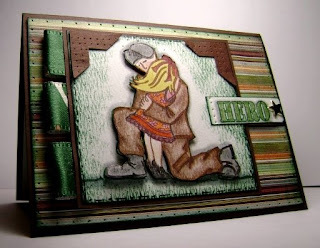 I used one of those beautiful camouflage ribbons for the tabs on my "HERO" card. This second card is called "I MISS YOU" and it was also designed with images and sentiments from Jami's "Come Home Soon" set. The sweet image alone speaks volumes. Wow!!! These are both stunningly beautiful my friend!!! They both have such warmth!! Such fabulous layouts on both of these!!! You're amazing!! These are gorgeous!! I love them both! Fabulous cards America! I need to get this set. Love the layouts on both and yur coloring is outstanding as always.